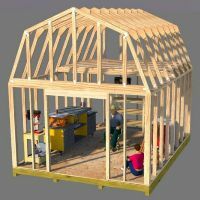 One shed foundation option is to build your shed floor on a gravel base. This method is very commonly used across the country. As you can see from the picture above the gravel base for this shed floor is slightly larger then the shed floor. 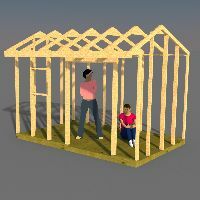 This option is relatively inexpensive and is much better than if you were to just build your shed floor right directly on the ground, which is not recommended at all. What Type of Gravel is Best To Build Your Shed Floor On? Choosing the right gravel is important for your base under the floor. Before you put any gravel down though there are some important steps you should take first. Removing the top layer of grass or ground cover should be done first. Next you will want to dig out an area that is slightly larger than your shed floor. The depth of this should be at least 4". The gravel you use should be marble sized rocks, and not round. Try to get crushed rock if possible. They will have an angular triangle shape and will lock together to make for a stronger base. If possible use a rolling machine to compact your gravel before building your shed floor. This step will also aid you in making sure your gravel base is absolutely level. Is This A Good Option For Your Shed Foundation? I wouldn't recommend this option for building your shed floor on! I have learned the hard way over the years that when a shed floor is not anchored down in some manner, additional problems may occur.This is due to the fact that inclement weather may wreak havoc with the stability of your gravel base causing your shed to become unlevel. This can cause a multitude of problems. Shed doors may not close properly down the road. Shed windows may not close properly. 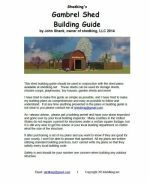 Siding may incur gaps allowing weather penetration into your shed. 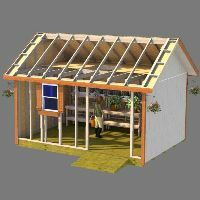 Your shed roof may leak. It's entirely possible that you may not encounter any of the problems listed above! If you do decide to use this option, you may want to consider at least using some cable tie downs to help anchor your shed to the ground. If your locality is prone to occasionally having high winds, you may experience some shifting of your shed floor, or your shed possible being blown over! 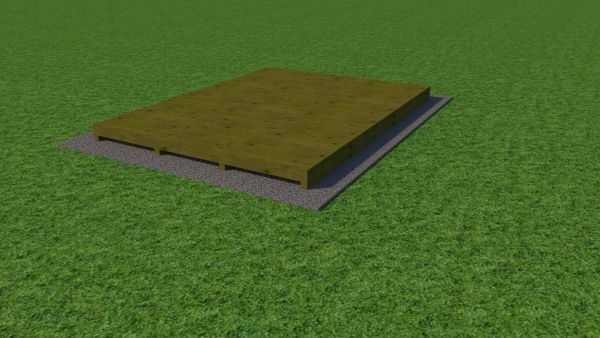 Here are a few more shed foundation options you may want to consider over the gravel base for your shed floor option.